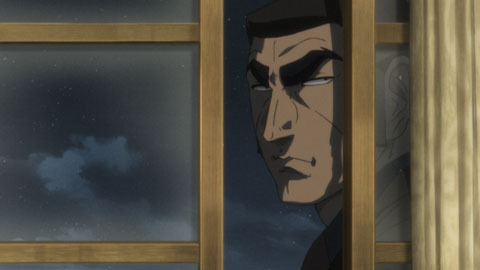 In my previous review of Golgo 13, my overall impression was that of disappointment. I had for years heard great things about this series. I had heard it praised as intelligent, thrilling and engaging. I found it to be none of those things but I did have hope that with the series being roughly 50 episodes in length it could potentially improve as it went on. I was wrong. Golgo 13 is a series that by all rights should be good. But for a number of reasons it prevents itself from connecting with viewers on any level other than casually enthusing them with brain-numbingly benign violence. The first thing you’ll notice with Golgo 13 is that it follows a certain formula without really trying to mix things up much at all. Most episodes are incredibly repetitive with the same beats being repeated. How many times can we see Togo coldly kill someone before it gets boring? Well the answer is about a few times. 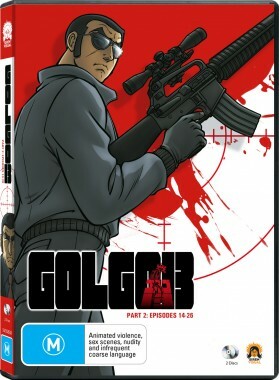 Unfortunately for Golgo 13, those fews times already passed in the last collection of the series. This part of Golgo 13 is very unfortunate due to it being simply the most stale part of the series to date. There is the repetition of formula that isn’t all that interesting to begin with and the bland and uninspired story-telling that does very little to provoke any kind of thought what-so-ever. It’s all just a messy blur of ideas on constant repeat. 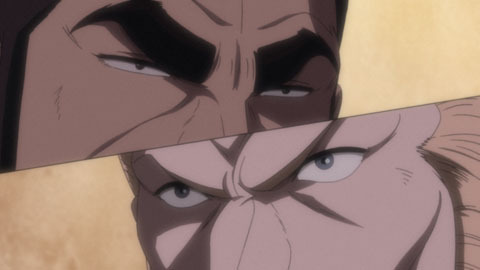 I mentioned in my previous Golgo 13 review that the series would be better served with longer story-arcs. I however was wrong as these prove to be merely a drawn out extended version of the one-off episodes. But ultimately the main issue with Golgo 13 is that it is just plain boring. The type of person that would like Golgo 13 is very very specific. They have to be a person who does not look for much more than gore and violence without any true meaning behind it. On that level Golgo 13 succeeds. It is a fairly violent series that doesnt expect much from it’s audience other than to gaze gawk-eyed at the ensuing brutality. It doesn’t aim for anything more than that and if you don’t fit within that category of viewer or just plain found part 1 boring, then you won’t find much more here for you in this part of the series. The aesthetics of Golgo 13 are quite simply repulsive. 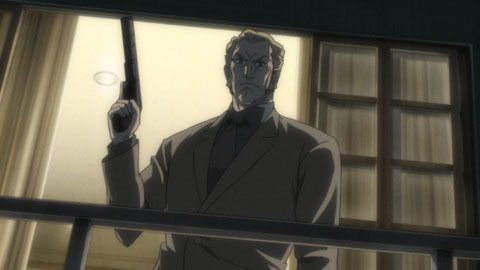 I mentioned this previously, but Golgo 13 is not at all an anime that looks good both art style wise or animation wise. It’s utterly droll and lacking even a modicum of inspired artwork. There is nothing appealing what-so-ever about this anime and it really makes it difficult to continue to watch it is just that bad to look at. The Answer Studio overuses grey and brown hues and the character design is incredibly ugly and poorly conceived. The series soundtrack is suitably dark and sets a fairly decent mood, but it’s so strongly overwhelmed by the series other negative aspects that it hardly makes up for the innumerable glaring issues facing this anime. Golgo 13 Part 2 much like Part 1 does not feature any bonus content at all. Personally I find this disappointing as this release could have used a buffer because this portion of the series was incredibly lacking. Unfortunately though not all releases can have special features on disc and this is just another one. I really do not know where The Answer Studio are trying to take this series, so far in the two parts amounting to 26 episodes that we have seen thus far, they have not impressed in the slightest with this adaptation. This anime is tiresome and does not even attempt to engage it’s viewers in any meaningful way. It is difficult to recommend Golgo 13 to anyone that does look for something with a deeper level of substance. It is raw and nonsensical violence and little more. If that’s what your interested in or looking for then by all means go and purchase both released parts of this series, it should provide you with some enjoyment for a few hours. But if that isn’t what you are looking for then unfortunately this really is not the anime series for you.